The HX7009 is a complete, cost effective, highly-efficient power management solution that is ideal for a wide range of portable handheld equipment. This device integrates two PWM step-down DC/DC converters, four low-noise low-dropout linear regulators (LDOs) and one battery charger in a single, thin, space-saving package. This device is ideal for a wide range of portable handheld equipment that can benefit from the advantages of technology but does not require a high level of integration. VBAT is a complete constant-current/constant voltage linear charger for one cell lithium-ion battery. The charge current of pre-charging and constant�Ccurrent charging is adjustable and it can be programmed to 700mA. An external resistor sets the charge current with high accuracy. 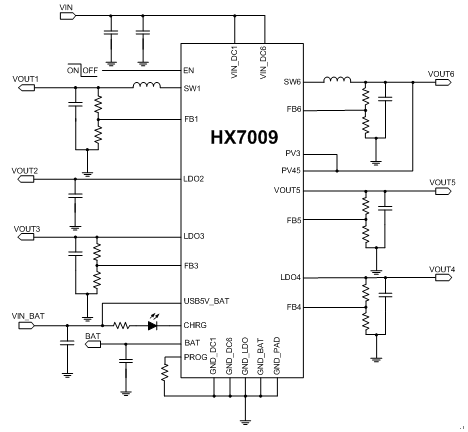 The HX7009 is available in a tiny 4mm × 4mm 24-pin Thin-QFN package that is just 0.75mm Height.